Set in Baghdad, 2004, The Hurt Locker follows three American soldiers in a bomb-diffusing EOD (Explosive Ordnance Disposal) team. The team leader, Sergeant William James (Jeremy Renner), is a brilliant but reckless wire-cutter who seems truly prepared to die every time he starts a mission. His two teammates, Sergeant JT Sanborn (Anthony Mackie) and Specialist Owen Eldridge (Brian Geraghty) provide cover fire while James disables explosives. The film explores the mental breakdown experienced by these men, as well as the addictive nature of the constant buzz of warfare. The Hurt Locker plays by very different rules than other war movies, which is appropriate, because the War on Terrorism is different from other wars. Most war movies show soldiers from opposing sides locked in battle, but the horror and suspense in this war comes instead from not knowing who the enemy is. While Sgt. James carefully cuts wires, always a moment away from death, other soldiers keep their eyes on the crowd. Civilians line the streets and are visible behind every window. Most have cell phones, some have camcorders, and constant paranoia is the only option in light of the frightening, inescapable truth: amidst the crowd of innocent onlookers, one person may have a finger on the detonator. Of the three main characters, Sgt. James functions best under the extreme stress, because he seems to have the least to lose. Sure, he has a wife and son back home, but in his own mind, he’s already let them go. While Sanborn and Eldridge worry about death, James goes looking for it. As the film gradually shows, he’s addicted to war. Even after James saves a soldier’s life, the soldier correctly states that he wouldn’t have needed saving if James hadn’t been so reckless to begin with. “I got shot because you had to have your adrenaline fix.” James doesn’t acknowledge this comment, but he doesn’t have to. The filmmaking is superb all the way around. The Hurt Locker isn’t a documentary, but it feels like one. The performances are completely genuine, and the camerawork is intentionally gritty, consisting primarily of handheld shots. The soundtrack booms at times and softens at others, all for the purpose of building tension and believability. Director Kathryn Bigelow ratchets the suspense at all times, so that even during moments of safety, we’re never really at ease. In this action film, the audience doesn’t want to see much action. We hope the bombs don’t go off. It’s a side of war that cinema has never seen, and I hope this film receives recognition at the 2009 Academy Awards. The Hurt Locker is one of the best films about the War on Terrorism, which feels strange to say, because war films usually have some distance on the events they depict and therefore bring some perspective. 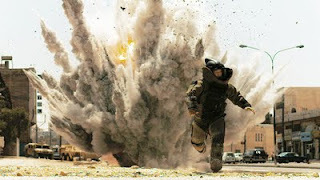 The Hurt Locker takes place in 2004, putting just five years between the setting and the release. The recent profusion of films set during a still-ongoing war mark a new phenomenon, but I won’t complain if we see more films as enlightening and well-made as this one. War films are an exhausted genre, but The Hurt Locker is one of the year’s best films, providing a new, suspenseful, insightful, and altogether memorable experience. MPAA Rating: Rated R for war violence and language. The Hurt Locker should be off-limits for preteens, but some teenagers could handle it, and it will definitely be less intense on video than in the theater. The violence isn’t graphic or overly bloody, but it is suspenseful and very realistic. There’s also a steady stream of strong language. Another well-written review. No, I haven't seen the movie yet, but want to now more than ever. And I guess that's one purpose of a movie review - to either entice or avoid.